Amy Powers is the creator of the online magazine Inspired Ideas and she blogs at inspireco.blogspot.com. She’s also the instructor of the immensely popular Happy-Go-Lucky Stitchalong workshop, which is now a self paced class. Amy believes that happiness is contagious—and craftiness is, too. And you’ll believe it as well when Amy is through with you! 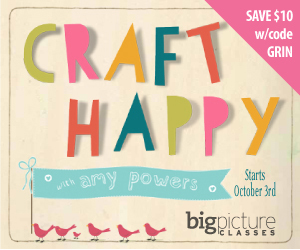 Craft Happy starts in the first week of October so get over and claim your place now.